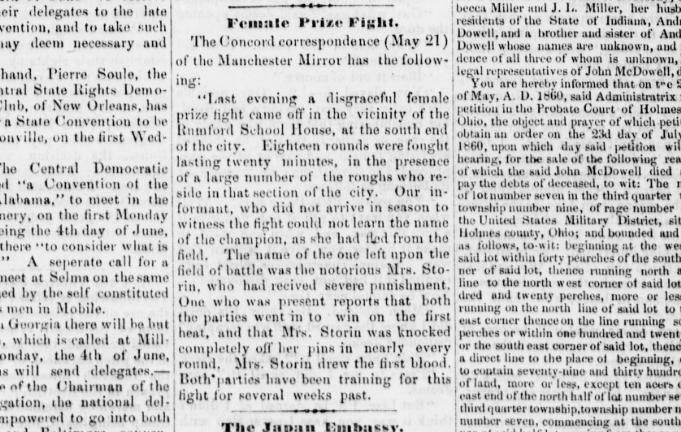 Another Female Prize Fight in Manchester, NH, 1860! What I find interesting, is that the piece was reprinted in a newspaper in Ohio from the original article in the Manchester Mirror. Another great job on research, Malissa. I’m fascinated by these signs of an active women’s boxing scene back then. Thank you so much for finding these pieces! They really are extraordinary! As you say, the language is a fascinating window into the place of women at the time! « A Female Prize Fight in Chicago in … 1856!